Wenn Sie den Begriffsdefinitionen der sog. Wirtschaftswissenschaften folgen, dann enden Sie in einem Labyrinth aus Smoke and Mirrors und werden die Sache nie klar bekommen. Das ist mit an Sicherheit grenzender Wahrscheinlichkeit so gewollt! Um die Sache klar zu bekommen, muss man sie von den beobachtbaren Dingen her denken. Eine erfolgreiche Investition ist ein erfolgreicher Aneignungs- / Enteignungsprozess. Der Investor (Unternehmer oder Staat) geht zur Bank und nimmt einen Kredit auf. Die Bank schoepft Geld = eine zur Umlaufaehigkeit veredelte Forderung = eine allgemein akzeptierte Forderung = eine Forderung gegen die Allgemeinheit aus dem Nichts und stellt sie dem Investor zur Verfuegung. Gleichzeitig kreiert sie eine spezifische auf den Kreditnehmer gerichtete Forderung auf Rueckzahlung = den Kreditvertrag. Der Investor kauft mit dem zur Verfuegung gestellten Geld z.B. Arbeitskraft gegen Lohn. Der Investor bestimmt die Verwendung der Arbeitskraft (z.B. den Bau einer Strasse). Am Ende gehoert dem Investor bzw. der Bank die fertig gestellte Strasse. Um seinen Kreditvertrag erfuellen zu koennen, fordert der Investor eine Nutzungsgebuehr fuer die Nutzung der Strasse durch die Arbeiter und diejenigen, die die Arbeiter gegen Geld durchgefuettert haben (Bauern), weil diese Geld erwerben mussten, um z.B. ihre Steuern zahlen zu koennen. So fliesst das Geld wieder zurueck zur Bank und dort wird der Kredit getilgt = das Geld wieder vernichtet. Bliebe es dabei, wuerde die Wirtschaft spaetestens an dieser Stelle zusammenbrechen, da ihr das Geld wieder entzogen wurde. Das System waere ueberbestimmt (zum einen durch die Zinsforderungen der Bank und durch das Streben eines jeden Teilnehmers Liquiditaet aufzubauen(1)), wenn nicht staendig neues Geld per Buchungsvorgang = Kreditvergabe kreiert wuerde. Damit das nicht geschieht, muss die Bank weitere Investoren mit investitionswuerdigen Projekten finden, die den Arbeitern Arbeit geben und sich die Arbeitsergebnisse wie oben beschrieben aneignen koennen, um so ihre Kreditvertraege und ihr zentrales Motiv "Mehr" zu befriedigen. Aber es geht natuerlich auch ohne Arbeit und damit vollkommen unproduktiv. Z.B. dann wenn per Kredit an den "Maerkten" spekuliert wird = unproduktive Umverteilung in Nullsummenspielen. Das System ist dadurch expansiv, erzeugt aber gleichzeitig hochkonzentriertes Eigentum an den Dingen (z.B. Produktionsmitteln) bei denjenigen, die von der Bank als kreditwuerdig erachtet wurden und diesen Kredit im obigen Sinne erfolgreich investiert haben. Geraet die Kreditvergabe und damit der Investitions- = Aneignungs- / Enteignungsprozess aus welchen Gruenden auch immer (z.B. Bindung der Geldschoepfung an Gold, Ideenlosigkeit der Investoren, Krisen, die den Vorgang und seine Folgen offenbaren) ins Stocken, droht unweigerlich der deflationaere Kollaps. (1) Mit ueberbestimmt, meine ich nicht, dass die Zinsen im Gesamtsystem fehlen, das tun sie definitiv nicht, sondern das eine Diskrepanz entsteht zwischen der vertraglich vereinbarten Rueckzahlungsrate (inkl. Zinsen), also dem Geldrueckfluss von Kreditnehmern hin zu Banken ueber alle Kreditvertraege und der freigegeben Geldmenge durch Sparer / Guthabeninhaber, also dem Geldfluss hin zu Schuldnern. Wenn dies geschieht geht entweder die Zahl der Nonperforming Loans bei den Banken durch die Decke oder aber es muss von den Banken neues Geld per Kreditvergabe injektiert werden, was dann hoffentlich auch den Weg zu Schuldnern findet. Ist letzteres nicht der Fall, weil die Sogwirkung hin zu den bereits hochkonzentrierten Geldvermoegen so gross ist, dass selbst eine stetige Kreditausweitung nicht mehr hilft, dann ist der deflationaere Zusammenbruch auch nicht mehr per Geldmengenausweitung aufzuhalten. Das System ist dann endgueltig gekippt. Vielen Dank an SB fuer das Nachhaken, was zu dieser Klarstellung gefuehrt hat. You may wonder where is part 2. Well, I guess it will take me a while to finish. 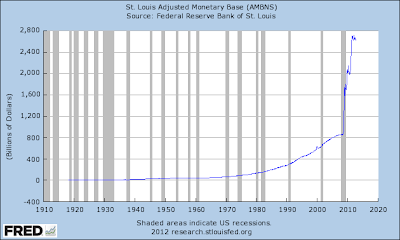 However, things are progressing and the next financial tsunami is being build. This time by Janet Yellen and her friends at Wall Street. "While Wall Street frets over the ability of bond markets to absorb an approaching interest rate rise, the U.S. Federal Reserve has a message for the industry: deal with it." As the chart above illustrates, interest rates set by the US FED followed a downward trend for 30 years and approached zero in 2009. Almost every hike was followed by a recession and a drastic drop of interest rates. It is important to note, that a hike in interest rates drives the value of existing bonds down and a drop of interest rates drives the value up. 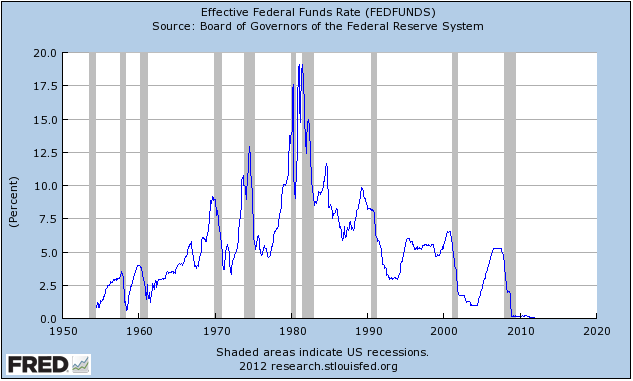 So what will holders of large amounts of low yielding bonds do, when the FED anounces to drive interest rates up? 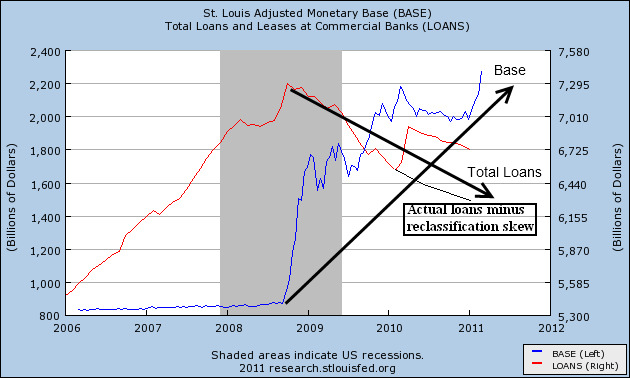 And what does that mean for the liquidity of the financial system and the real economy? 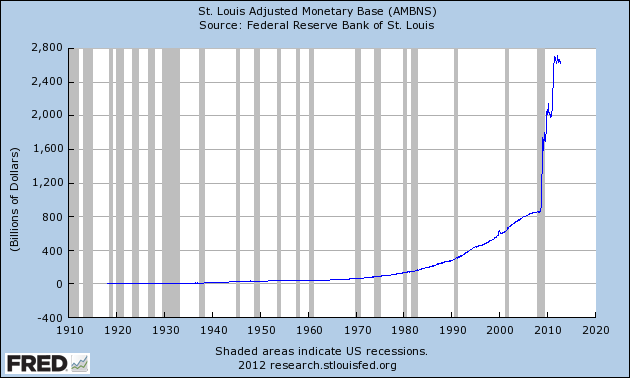 The level of US central bank money in the system has reached 4000 billions US$ at this point in time, about five times the level before the outbreak of the GFC. But the fundamental problem of a tremendous current account deficit is still there and the cumulated piles of US$ nominated paper in the hands of hyperproductive foreign economies like China, Japan and the oil exporting countries did not disappear. P.S. : The first law of liquidity: When it is most needed, it will be least available. To understand why, I recommend to view the following in the given sequence. It will be worth the time spent. How to create a financial tsunami and steer attention away from its epicenter. 1. You cheat your currency into the status of world reserve currency and force international trade to be nominated in that currency. 2. You enjoy a permanent and steady growing current account deficit with most of your trading partners, since every nation, that want to engage in international trade, has to build up liquidity (reserves) in your currency. Which means they have to ship goods to you, to receive paper money created by your central bank in return from you. 3. Should a weaker trading partner fail to comply to the reserve requirements, you "help" via international institutions like IMF and World Bank, where you have secured yourself a dominant role. And to get those derailed odd balls back on track for you, these international institutions will apply the so called "Washington Consensus" on to them. In case the odd balls are not willing to follow and implement the recipe, they are cut off the international payment systems and with that, they will be cut off from international trade. 4. Since it would become obvious, that your ever increasing cumulated current account deficit is financed by your central bank, you let your government issue bonds and let them be rated triple A by your rating agencies. So foreign "trading partners" can convert their piles of your currency into interest bearing bonds of "very best quality". And as long as your government issues enough such "attractive bonds" to cover your current account deficit with your trading partners, your net outflow of central bank money should be minimal. 5. When it becomes foreseeable that the cumulated debt of your government approaches a ceiling, you ask the most talented people of your finance sector to become creative. And they certainly will be able to create a more then sufficient amount of triple A rated papers out of mortages and subprime mortages issued by commercial banks and semi commercial institutions like Fanny Mae and Freddy Mac. Bundled, cut into tranches with the higher risk tranches insured by CDS´s written by the world largest insurance company (AIG), you get a tremendous amount of "attractive and treasury like quality" triple A papers that can be sold to foreigners. So you keep the net outflow of your central bank money minimal, while continuing to consume foreign goods at a reckless rate without delivering something real in return. 6. To ignite the tsunami, you hire an "talented economist" like Ben Bernanke to become head of your central bank. This guy will raise interest rates and curb the creation of new central bank money to zero. 7. With that a certain amount of the weakest subprime mortages will default and trigger a chain reaction, which will result in a sharp increase of net outflows of your central bank money while the central bank is still on the monetary brakes. 8.1 Your current account deficit stays high, since your economy has become deeply dependened on the delivery of foreign goods like oil etc. 8.2 Your "trading partners" not only stop buying your triple A crap papers = stop returning your central bank money received as payment for the goods delivered, but they will start selling that stuff off = demand additional central bank money out of you. Since a good part of the defaulting papers were "insured" with CDS´s, this creates an enormous lever, since the premium payments (1% of face value) of the bond holders = inflows for you, turn all of the sudden into a 100% of face value obligation = outflow for you and your "insurance industry". 8.3 First money markets and then commercial banks in your country run dry. 8.4 Only massive bail outs by your central bank and central banks around the world can stop a total collaps of the global financial system. 8.5 Your central bank is forced to substitute the ceased purchases of triple A rated papers by foreigners by so called quantitative easing as long as your country runs a current account deficit. 8.6 You stay unable to balance your trade with foreign partners, since your economic leaders decided to move jobs to the workbench of the world for a higher profit, at the high time of the scam. 8.7 Your chief economists start talking about "bubble up for ever" and "secular stagnation".